Seth P. Lerner, MD, discusses standard of care treatments for UTUC, the quality of life burdens they pose, and the importance of elective nephron sparing to assuage those negative effects. He describes current and future nephron-sparing methods, especially the use of Mitomycin C (MitoGel), which is under review in the OLYMPUS trial. These are my disclosures. I’ve underlined UroGen because they are the company that has developed this company I am going to be talking about. I have some support for Advisory Board and Baylor receives financial support for my role as the coordinating PI of the clinical trial that I’m going to talk to you about. We have other support for clinical trials in some other advisory boards for your information through the talk. But I will—the only thing I’m going to be talking about relevant to the disclosures is Mitogel, which is the UroGen product. What I did is I put a few slides together to just sort of bring us around to the idea of both imperative and elective nephron sparing when we are talking about upper urinary tract urothelial cancer, and during an ad board yesterday with the company just talking about both the upper urinary tract and lower urinary tract product development, there was kind of a consensus that perhaps outside the academic medical center out in practice that you may not be seeing a lot of upper urinary tract disease, and so this hopefully will sort of get us all on the same page about some opportunities for applying current technology for nephron sparing, and then obviously, that’s where this product that I’m going to talk to you about is positioned. So for I would say large volume inability to control low-grade disease, certainly for high-grade disease, nephro-U has been sort of the standard of care certainly for mid or proximal ureter/renal pelvis. We still do nephron sparing surgery for distal ureteral tumors, and sort of the challenge there that we are all aware of as urologists taking care of an elderly patient population is we are reducing renal function by half. And that is okay when it is indicated, but it creates lots of opportunities for nephron sparing disease and trying to avoid the long-term consequences of chronic kidney disease and exposing the patient to risk for dialysis. So if you look at the impact of GFR on overall survival, you can see what happens both in the pre-operative state, eGFR above or below 60, and then in the postop, you can see a pretty profound long-term impact with reduction of EGFR using cut-offs above 45 or below 45. So that doesn’t become apparent in the first two to three years, but if you look long-term and past 8, 10 years, it’s pretty profound, when you think about what the long-term consequences are of reducing renal function from a surgical standpoint. So we are all aware in the context of renal parenchymal kidney cancer of imperative indications for nephron-sparing surgery and certainly the technological development with robotics and minimally invasive surgery makes this a bit more widely applicable, and so certain medical or otherwise chronic kidney disease bilateral tumors, and then someone who has a functional or anatomic solitary kidney, and now, as we all know the indications for that have been expanded dramatically with elective partials for small renal masses. The cut-offs seem to be getting larger and larger as we all gain more experience with partial nephrectomy, and then in the case of urothelial disease, I would say that certainly small volume disease that can be ablated usually with a laser or heat, distal ureteral high-grade disease. I think a lot of us are doing elective distal ureterectomies in that setting, and then as we are doing more systemic chemotherapy, which I’m not really going to talk about in this context for high-grade upper urinary tract disease, are there opportunities for nephron-sparing surgery in the patient who has an apparent clinical complete response post chemotherapy. The uteroscope now with thin, flexible scopes that are very easy now to access really all aspects of the upper urinary tract, there’s almost really no compelling reason to commit a patient to any kind of surgical therapy without completely visualizing the upper urinary tract, getting biopsies, getting cytology, and having that guide us in our consideration of various treatment options. High-grade cytology today with the current Paris system is really equivalent with high-grade urothelial cancer. Cytology should be fairly easy to get. I’m not—there’s other ways to get good quality liquid biopsies such as using a brush, a post-brush wash for cytology if you’re having difficulty actually getting a biopsy on a piece of tissue. We’re all aware that the instrumentation though that we have with these small flexible scopes or maximum 1mm biopsy either with Cook biopsy forceps or Perata, you can get more tissue using a basket like you do for stones, and so a high-grade cytology is equivalent with high-grade cancer, and that is going to drive us down more of an extirpative surgical management and is associated with a much higher probability of an invasive phenotype either T1, T2, or greater. What is interesting, and this is somewhat true in the bladder as well. Mark Schoenberg, who is in the back, published a nice paper a long time ago about the concordance of visual cystoscopic assessment of grade and stage, and the pathologic assessment and so we’re pretty good as this low-grade/high-grade, but the visual inspection alone is really not adequate to determine grade, and certainly not stage, although I think that most urologists would be adept at saying I think that is cancer, and if you are looking at a papillary tumor or a solid, high-grade invasive cancer, we’re all going to be pretty good with that, but biopsy really becomes an imperative for in that setting. The only caveat that we all need to understand is that a low-grade biopsy will correlate with low-grade final pathology roughly about two-thirds of the time. It gives you a good signal that you are probably dealing with a low-grade tumor, but we’re all aware in the bladder of mixed grades, even within the same sort of TURBT. Moving along, just some options for nephron-sparing surgery. In addition to what we can accomplish through a ureteroscope, and this is not our published data, but there’s a fair amount of published experience using percutaneous resection. It’s certainly not the primary mode of dealing with a large-volume tumor in the upper urinary tract, but if you are comfortable with percutaneous stone treatment then obviously the access is the same. You can use—I’ve used a resectoscope in the kidney on occasion, when there is an imperative for nephron-sparing surgery ,and I can’t control the tumor. It’s kind of an option that you want to have in your back pocket if endoscopic surgery in an imperative setting for nephron sparing exists. A lot of data on distal ureterectomy, the classic indication being a large volume low-grade tumor, but as I mentioned high-grade disease is also an option. In a setting—I’ll give you just a little vignette, a patient that I’ve been taking care of for quite some time, high-grade metastatic tumor, node positive tumor in his mid ureter, kidney was fine, proximal ureter was fine, really had some CKD. We didn’t want to take his kidney out. Went in and did essentially a near sub-total ureterectomy, bladder cuff and built him an ileal ureter, and he has done fine since that time for quite a long time. The other techniques that we have for ureteral reconstruction, say in benign disease, can occasionally be applied in settings, again, where sparing the kidney makes sense. You have to construct these in such a way that you can still sort of look up there with a ureteroscope. And outcomes in this setting, when you’ve got an imperative for nephron-sparing, are quite similar to nephroureterectomy. One of the things that we talked about yesterday was thinking about, particularly in the setting, where you have biopsy proven low-grade disease, not just look it—the nephrectomy for most busy practicing urologists who have experience with this is a fairly straightforward operation. Most of these can be done laparoscopically, but think about some of these other strategies for managing low-grade disease even when there is not an imperative for removing the kidney. So now moving along to intracavitary therapy, meaning putting drugs up in—primarily in the renal pelvis. I don’t think you can really treat ureteral disease with installations, and I’ll make my public sort of statement about what I feel about intravesical with a stent to try to—with a double-J stent to try to treat upper urinary tract disease. The EAU has guidelines for upper tract management. They were published in 2015. I’ve got the reference for you there, and the level of evidence is obviously modest for use of BCG or Mitomycin in an adjuvant setting, for patients either with say large volume low grade or Ta high-grade disease that you are able to ablate completely, or CIS, which would be the main indication for using intracavitary BCG. You can do this, even though I’ve provided some caution there, and a lot of us are doing more of this treatment through a ureteral catheter that you just have the patient come in, flexible – – put up a wire, put up the catheter, treat. You can take that out and be done at the end of it. If the patient is accepting of a weekly cystoscopy and stent placement, I’m sorry and catheter placement for the treatment, you can certainly leave the catheter in, tie the—leave the Foley catheter in, tie the ureteral catheter to that, but then the patient obviously has that for five weeks straight. I think most of the patients are going to—some of the patients are going to prefer sort of the weekly installation. The obvious solution, if that is not good for the patient, is to stick a small nephrostomy tube in the renal pelvis for the duration of the treatment. I will say publicly, I don’t think—I think it is fairly naïve to think that we can treat upper urinary tract ureteral cancer, I should say treat as an adjuvant therapy, much like we do in the bladder or treatment for CIS by instilling say BCG in the bladder and using a double J stent. The only caveat to that is there is one study from Japan, which showed that they did have some success. A small study, but really I don’t think that is with the exception perhaps of the very distal ureter, if you expect that you are going to get reflux, that may be probably the only possibility where that would work. That’s Seth Lerner’s opinion, view of the literature and I don’t use that technique. I prefer to put a catheter up or put a nephrostomy tube. So this has a long history, well, not that long, 1985, this was Jeff Huffman. Jeff was one of my professors at USC during my fellowship and we’ve gone through this. You can use most of the drugs that we use in lower urinary tract. I think we’re all aware of the caution with BCG in the upper urinary tract, because if you do that in the setting of obstruction or if you have extravasation we’re obviously exposing the patient to the risk of BCG sepsis, and there have been deaths reported in that setting, so when you do this, you have to have a system, and I’ll show you very briefly that for monitoring the—for minimizing the pressure elevations, which is really what the problem is with giving BCG in the renal pelvis. There’s a standard of care for testing new drugs in the lower urinary tract by leaving a small low-grade tumor behind and then giving your drug. This has actually been shown in virtually every chemotherapy drug that we use in BCG to be—you can ablate small volume, low-grade disease about 70 to 80% of the time. Naturally, that is not sort of how we do it, and we teach that in the lower urinary tract, you want to have a complete resection or ablation of all visible papillary disease prior to therapy, but as you will see, as a prelude to the clinical trial that we’re doing with the Mitomycin C reversible gel, we’re leaving tumor behind and using an ablation approach that’s very reminiscent of the marker lesion data, and this is just sort of a summary of the data, and a very nice publication in the Journal of Urology from 2010. If it is a topic that you are interested in learning more about. This is just a diagram of doing this either through a nephrostomy tube in the kidney on the right or through a ureteral catheter on the left. I think you—obviously I think it is apparent that you want to have sterile urine. This is an infusion that typically you can do over an hour, and historically when we did this we would use a pressure manometer much like you would do for a spinal tap to keep the pressure below 20cm of water. In talking yesterday, I think people have evolved to just setting the level of the infusion at that 30cm mark and having a pop-off valve so if the pressure in the kidney goes above 30, it will just go out the pop-off valve instead of increasing the pressure. So this is one of the—I use the term, pardon me if I’m offending anybody, the dog and pony show. I apologize if that is offensive, but it is a lot of work, and time, and effort. You have to do this right, and this risk of I guess sepsis really relates to BCG. I’m not sure it’s so much with the chemotherapy drugs, and we don’t do this sort of set up with chemotherapy. We just infuse it, and so that is probably one of the reasons why certainly out in the practice setting where you are not seeing this in any kind of frequency you are most likely going to be reluctant to sort of go through the logistic issues of giving BCG in the upper urinary tract, and perhaps that is where novel drug delivery systems, and although and novel approaches to managing upper urinary tract disease where you’ve got an indication for nephron sparing come in handy. So what are the data? This is just showing you some published data on the use of BCG and some of the outcomes related to CIS and stratified by carcinoma in situ or papillary disease, and so remember that the historical data with CIS and the lower urinary tract without treatment about half of those patients within five years would develop a muscle invasive bladder cancer. The untreated natural history of CIS in the upper urinary tract is a little bit of an unknown, partly because you know a lot of those patients end up getting nephrectomies as definitive management. 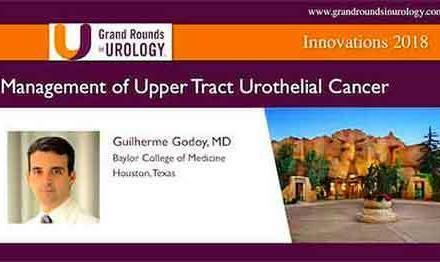 So, is it the same sort of untreated natural history in the upper urinary tract with this 50% progression? Obviously, today we don’t observe patients for that period of time. We either take their kidney out or do some sort of therapy, and I think that these are some data that give us some cause for optimism when we are treating high-grade disease in a nephron-sparing setting. And this is just a nice review of 12 series looking in patients after resection of Ta/T1, where you have an indication, and again it suggest that BCG can be effective in those patients. It’s definitely worth giving this a shot prior to making a commitment to taking the kidney out. I’m not talking about really anything that is more than T1, and quite frankly T1 high-grade disease presents in my opinion a bit more of an imperative for a nephrectomy if you’re not going to put the patient on dialysis as a result of that. And perhaps the best use of BCG is in the patient with CIS. Just briefly how do you make a diagnosis of CIS in the upper urinary tract? Well, certainly you can do that by biopsy, but that can often be a bit challenging, so it would be the patient who has a bona fide positive cytology localized to say the renal pelvis and obviously no visible papillary disease, and nothing radiographically that would suggest you have a papillary or invasive cancer, and I think in that setting using a brush can be quite helpful. So our sequence typically will be obviously you do your inspection, okay. And why am I doing this? Because I’ve got obviously a cytology or some biomarker that is cluing me in to a problem in the upper urinary tract or I’m following the patient endoscopically who I’ve treated previously so I’ve got a reason to be up there. So I’ve looked. Everything looks okay. Maybe I see some erythema that makes me a little bit suspicious. I do a wash cytology. I’ll take a brush and go back and forth and wherever I can get contact with that brush to dislodge cells, I’ll take the brush. I’ll put it on a slide, pap fix, fixative, so this is just like a PAP smear, and probably the most valuable next step is the post brush wash cytology. Okay? And this is all stuff that is easily available to us, probably takes about five minutes if you think through it, and then you put all of that, and obviously you want to try to get a biopsy. You put all that together, and if you have a positive cytology showing high-grade disease and nothing visible papillary that is CIS, basically. And then you have an indication to consider treatment with BCG. So just a summary of what I’ve talked about so far and just look at the third bullet point, and you know this is sort of the unfortunate reality that because what we are dealing with is, you could argue, a rare disease, although, you know, it is something that we see certainly in academic centers quite frequently, but everybody is going to see it in private practice at some point. And so as a result, we’ve got low-level evidence to guide us. That is changing because of all of the excitement that you are going to hear about most of the day today about understanding the biology of bladder cancer and drug development. And so naturally, some of that stuff is being applied in the upper urinary tract both from a technology standpoint in terms of access visibility and then as I’ve already mentioned drug delivery and drug development. So clinical trials are really the key. So clinical trials are really the key. Raise your hand if you’ve ever used this product. Interesting. Raise your hand if you’ve ever heard about this product. Okay. I heard about it. So what is BackStop? We’re all familiar with the problem say when we’re dealing with a mid-ureteral stone, and you’re working on that stone, and all the sudden it’s back up in the kidney and now you have a bit of a harder problem to deal with. So this is a very clever technology. I had no relationship to the development of this. So this is a thermal reversible gel that you can inject proximal to the stone, and then at body temperature, it forms a semi-solid gel, if you will, that prevents your stone from migrating proximally. You can deal with the stone. You inject cold fluid, and the stuff dissolves, and presto, you are done. This is just a paper that describes this. I’ve personally never used it. David yesterday alluded to, if you are old enough to remember the coagulant pyelolithotomy for taking out complex stones in the renal pelvis, although obviously that is completely different technology, but the idea is “gelation,” if you will, for some purpose. So that is the technology that this product is based on. So this is MitoGel is an admixture of thermo reversible gel and Mitomycin C developed by a chemist in her kitchen about 20 years ago, and this thermo reversible—these thermo-reversible properties are used in a variety of different settings in non-medical situations, and I’ve shown you an example in urology in medical settings, and so it’s just a very clever sort of thinking about how do you get—the obvious problem in treating the upper urinary tract with installation is that it doesn’t stay there. So many of these drugs require contact. BCG requires contact, or through a concentration gradient say in Mitomycin C to get it into the tissues to do its ablative effect, and this is simply a way to get a drug in this case Mitomycin C to hang around. I’ll show you for about 4 to 6 hours. And if you just look at the two pictures on the top there, it’s liquid and injectable at cold temperature, and then when it gets into the body, it solidifies to a certain degree, and then because it’s water soluble, as the patient produces urine, it dissolves over a period of time. But now you’ve got Mitomycin in this case sitting there for about 4 to 6 hours. This is nice work done by Alan Pantuck and Karim Chamie at UCLA. They’ve done a lot of work in the pig model, and what the images show on the bottom is that the gel will stick around for about—it takes about 8 hours, 4 to 6 hours for it to completely dissolve and elute. And they didn’t show any really issues with absorption. The PKs were fine. This is some nice pre-clinical work showing some of the pharmacokinetics of this clever technology. So this reminds me a bit of some of the tools I used to use when I was doing stone work. That probably goes back to when I was a resident, and because if you look at the syringe there on the right, it’s sort of—it’s viscous. I mean, you can’t just take a regular syringe and inject it. This injector is a pressure injector, and so the product is mixed by the pharmacist, and then it comes to us in an ice box because at cold temperature we need it cold and we need it liquid so we can inject. You take it out. You pop it in this injector. You’ve got your ureteral catheter up. We typically do this through a 6 or 7 French catheter, although we are hearing that some people are able to do it through a 5. You make sure fluoroscopically that the catheter is positioned where you want it in the renal pelvis, and then you inject the predetermined volume of the MitoGel. These are some examples of compassionate use, so I need to just kind of tell you briefly about this program. I suspect everyone is familiar with the concept of compassionate use taking a drug that either is not approved for anything or approved for other indications and getting it—allowing us to treat on an N of 1 basis where on a compassionate use, where someone really doesn’t have any other options for standard therapy. And the FDA has been very supportive of this program, which is not going on anymore because of the clinical trial, but the company was very sort of forward thinking in giving access for this drug for a lot of us, and most importantly for our patients, who really didn’t have a lot of other options. So this is an example from Gregory Worth, who really was the first person outside of Israel to use this. This is an Israeli company, and what you can see on the—you see the obvious filling defect, you see the tumor here, and someone mentioned yesterday, well, why didn’t he just laser this, and unfortunately I don’t have all of the details of the case. There may have been—maybe there was a lot of other tumors and this was the end of it. This was what was left behind. So post-treatment weekly for six weeks, and you see the resolution of the filling defect, you see some treatment effect and an obvious ablative result in this particular patient. So I have to be careful about the term “enrolled.” Each one of these is an experiment, an N of one trial. It’s not a clinical trial. It’s a case series and with all of the caveats and limitations of case series, but if you look on the right in the patients with low-grade disease, about 40, 44% of those had a complete response with six weeks of this treatment. And so this is really kind of the first indication that delivering Mitomycin in this fashion, up to the renal pelvis, in patients with documented low-grade disease can have an ablative effect. We will call this to some extent proof of concept. This data is pretty much set, and a manuscript is in preparation and close to being submitted. So the clinical trial is outlined here. I’ll go through the inclusion and exclusion criteria, but suffice it to say, that these are patients for whom ideally you’re trying to spare them from extirpative surgery, and it’s either a setting of say, recurrent low-grade disease, hard to control. In many cases these are tumors that are difficult to access, particularly the lower pole with angulation. It’s hard to get—you might be able to get your scope there to see it, but you can’t get a fiber through it to actually do any work. And so there’s lots of reasons why I think we would want to be able to have a drug that we could get up there that would stay up there from an ablative standpoint. The trial is designed to treat tumors that are either from a 5 to 15mm diameter. It could be a partially resected tumor, or a tumor that you’ve biopsied and proven that it’s low-grade disease. They get treated weekly for six weeks taking a page from how we do this in the bladder, and then within about a six-week time, we do a repeat ureteroscopy and document the findings at that point, and then if the patient has a complete response they can go on to monthly maintenance out to a year. We’re looking at the primary endpoint really is the initial complete response, and then in those patients who have a complete response, the durability of that. And this is just the outline of the treatment and the target population. This is an interesting interaction with the FDA because they have set the bar actually quite low. You see the 15% there, and they have given the company a fair amount of flexibility in not setting an a. priori bar that you have to reach in order to determine efficacy of your drug for registration. It’s a very sort of unusual situation with the FDA, which is good for us, good for our patients because even if we show something say even like a 20% complete response and let’s say that is durable, that potentially could get us a technology and a drug in our hands to help these patients. So, that’s good. These are the inclusion criteria. We don’t really have any data to suggest that this would be effective in high-grade disease. The FDA was very concerned about avoiding the perceived standard of care of nephrectomy for high-grade disease from a safety standpoint. We have to do a lot of things to minimize the risk of there being high-grade disease. So we have to have biopsy-proven low-grade, a cytology that does not show high-grade disease with the idea that by doing that we’ll really ratchet down the probability that we’re missing a high-grade tumor. And then I mentioned the indications and the criteria below in terms of having a measurable, a tumor that’s treatable. Now, these are the exclusion criteria. Again, the idea is to try and minimize the risk of there being a high-grade tumor carcinoma in situ in the upper urinary tract and obviously no concurrent treatment with systemic therapy. This is just the current status of the trial. I’m not—I can’t tell you, not because I don’t know, but I can’t tell you the current status in terms of enrollment, but suffice it to say, I think I speak for the site principal investigators that there has been an extraordinary amount of enthusiasm and support for doing this. For any of us here today who see even a reasonable volume of these patients it’s troubling to not really have good tools to deal with the large volume, low-grade disease, the intracavitary treatment, and so fortunately, there is a lot of development going on in this space, not just by this company. Seth P. Lerner, MD is Professor of Urology and holds the Beth and Dave Swalm Chair in Urologic Oncology, in the Scott Department of Urology, Baylor College of Medicine. He is Director of Urologic Oncology and the Multidisciplinary Bladder Cancer Program and Faculty Group Practice Medical Director for the Urology Clinic. He earned his medical degree from Baylor College of Medicine, completed a surgical internship at Virginia Mason Hospital in Seattle, and returned to Baylor for his residency training. He completed a two-year fellowship at the University of Southern California in urologic oncology and reconstructive surgery under Peter Jones and Don Skinner before returning to join the full-time Baylor faculty in 1992. His clinical practice, education, and research activities are devoted to urologic oncology and particularly lower and upper tract urothelial cancer. Dr. Lerner is author of 190 peer-reviewed articles, and co-editor of a comprehensive Textbook of Bladder Cancer. He is the founding co-editor-in-chief of the Bladder Cancer journal. 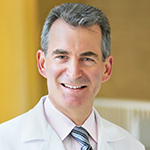 He established and directs the multi-disciplinary Bladder Cancer Research Program at Baylor, and his research interests include use of selective estrogen receptor modulators for treatment of bladder cancer, gene therapy, integrated genomic analysis of bladder and upper urinary tract cancers, and outcomes of radical cystectomy and pelvic lymphadenectomy. He has 25 years experience as a clinical investigator for both NCI and industry funded clinical trials. He is the PI of the ongoing SWOG NCI Phase III trial comparing extended vs. standard pelvic lymphadenectomy at time of radical cystectomy. He is active in the leadership of several national bladder cancer research enterprises including chair of the Local Bladder Cancer committee of SWOG, founding and former co-chair of the NCI Bladder Cancer Task Force and current co-chair of the NCI CTEP Genitourinary Steering Committee, and he has co-chaired the Analysis Working Group of The Cancer Genome Atlas Project for muscle invasive bladder cancer for the past 7 years. He is very active in the Bladder Cancer Advocacy Network (BCAN) as a member of the Board of Directors, past chair of the Bladder Cancer Think Tank and co-chair of the management committee of the Bladder Cancer Research Network. Dr. Lerner is an active member of the prestigious American Association of Genitourinary Surgeons and is listed routinely among “America’s Top Doctors” and “Best Doctors in America.